Hello…. welcome to my website and blog – or as as I like to think of it: a Big Leap into Open Galaxies! A sort of online journal, and place to share my art and words with you. I draw and paint in various traditional art media, and sometimes on the iPad, and also write and illustrate poems. I live in a lovely country town in Australia. I’m happily married, a mum of four boys – young men now; someone who loves Jesus, love to: draw, paint, write, read…walk our dogs – two Jack Russells – look after the garden; and like a quiet life – not always easy to have during those busy days with a young family! Some of my formal qualifications. Visual Art Diploma with majors in Drawing/Painting; to which I included a major in English Literature. Graduate Diploma in Education: Secondary (High school ) teaching : Art and English. While raising children, in-between cooking, cleaning, and the washing machine; much of what I wrote and drew, (now a large filing cabinet full) – was scurried down in a hurry, and is still in various draft stages. Some I’ve finished. And now my family are young adults, I hope to God-willing, bring more of it to completion. From my hand-made book I did a few years ago “Poems from Home: a Collection of illustrated Haiku”. My kitchen is an everchanging gallery of notes and pictures. 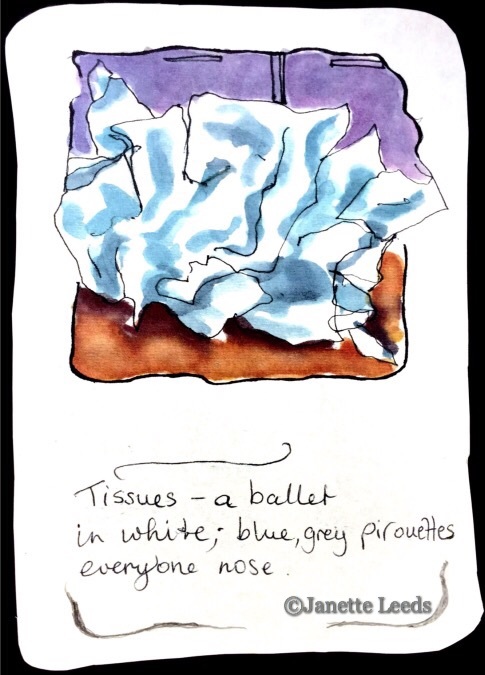 Everyday-things, are often my subject matter – even tissues and kitchen sinks, star in my watercolours and haiku. 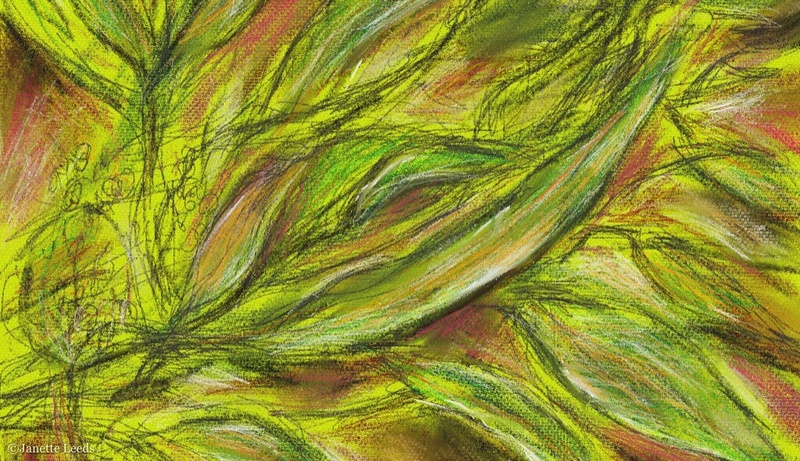 With increasing flights into flowers, foliage, and landscapes for my art. As well: my faith in God; how ordinary things are often extraordinary; how special life is; these themes spill into my art and writing. Idea draft from a few years ago in: ink-pen, watercolour, on paper – for presenting language info. 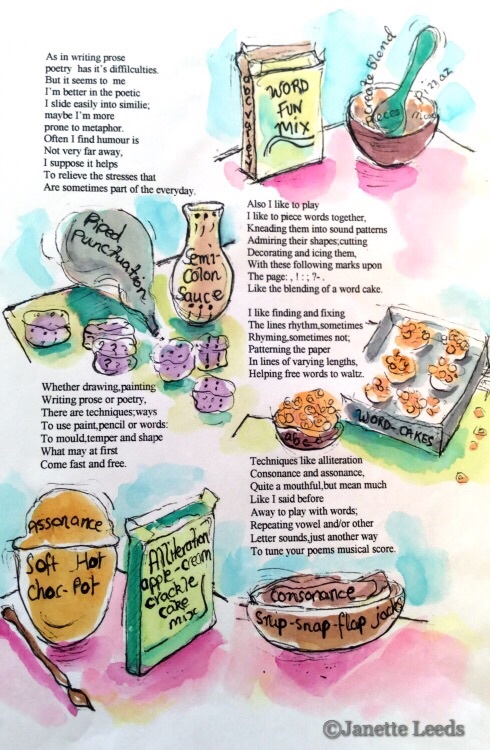 I flavour my poems, both haiku and my longer poems with: alliteration, personification, assonance…fancy sounding terms for good fun with words. These language devices often appear in whatever I write – for me, a sort of natural occurrence – wisely used they can add music and colour to sentences. Drawn with my finger (rather than a stylus) using: pencil, charcoal and paint in the “Art Set Pro” app. Drawing and painting on the iPad, is an exciting addition to my work in traditional media: watercolours, gouache, ink pen, acrylic, pencil…. I use art apps with such natural looking media, that my iPad art often looks much the same as my work on paper or canvas. I prefer to paint and draw with my finger on the screen, rather than use a stylus, and I think it makes it all the more enjoyable. I print some of my iPad art, and use archival inks and lovely acid free matt paper, on my inkjet printer. Sometimes I mix traditional and art app media together. I’m thankful to a friend who helped initiate my leap into the online world. She freely offered some information and advice, and pointed me in the direction of WordPress – where I proceeded to build this website. I built this site on my iPad – hardly ever use a computer, for anything. Thankful to WordPress, for their excellent: tools, resources and support. The iPad has become a handy, compact studio for many of my creative projects. I keep a keyboard attached to my iPad. It makes typing a lot easier, and it prevents the iPad’s keyboard popping up when I’m arranging my art and words. There’s some information on apps I use on my page, “Some App Information”. I also share posts on these areas. Thankful to God for my life – for everything. 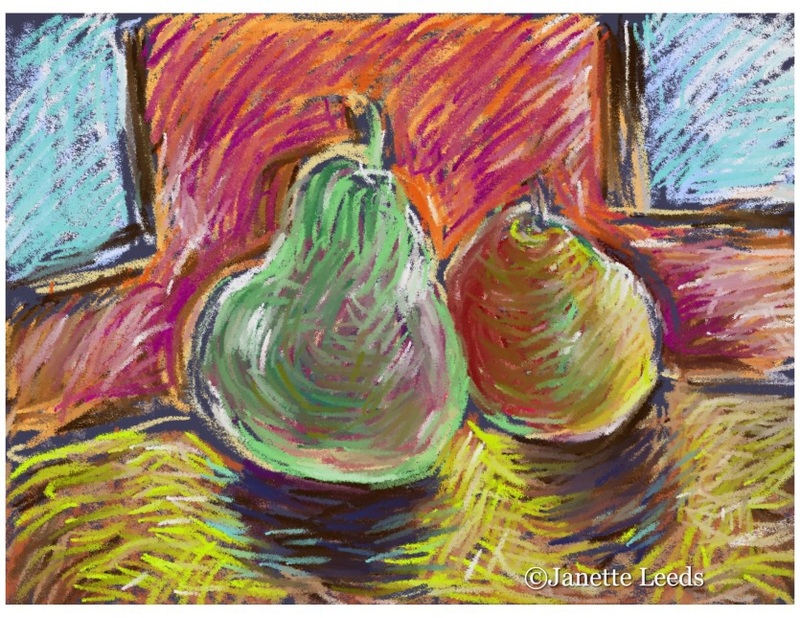 *All images and text © 2014 – 2019 Janette Leeds. All rights reserved. Ah, I must have missed the Australia reference the first time around. I’m a believer too, by the way (RC), oh and coincidentally, at the moment, I’m obsessed with The Doctor Blake and Miss Fisher Mysteries! Lovely to know you, Janette. P.S. I’d love to see more of your “Poems From Home” collection; is it on this blog? As you can see here, yes I do live in Australia; it’s a beautiful place to live, hmm, though I may be a bit biased. 🙂 Love the photo on your blog header…is it your garden? Not sure where you live? Thought either America or Canada, where it seems most of the bloggers I’ve come across in the blogosphere, are from. I’m enjoying blogging (even got used to the sound of that word); didn’t realize this sense of community thing, was going to occur – quite enjoy it. I noticed you said in your bio about being introverted and sometimes out going…sounds like me…as you would have noted in my very long bio! From all of the writing on this page, you wouldn’t think that I mostly like to write shortish poems..haiku..and so on, but I do. I have shared some “Poems from Home” in posts; they are in the form of illustrated haiku (or haiga). I’ve put them together as a book and written an introduction; a bit of which, is in this post..comes up in a few other posts too. So nice to meet you too. I also love Miss Fisher’s Murder Mysteries and like what I have seen of the other Aussie show – shall try to catch up with that one. Thanks for all your comments! I look forward to your future posts. All the best, Janette. P.s Glad I finally was able to put the comment section on this page – for some reason, had difficulty getting it on here. Nice to get comments here. Cheerio. Busy morning ahead, but I’ll get back to you soon. Just while I have a moment, I’m in Ontario, Canada. Are you on Facebook, by any chance? Would love to connect there! I found you, but I see you don’t have a personal account. If you read my details, be advised that I basically lie to Facebook. I didn’t study at the Open University, I went to University of Toronto, and I don’t live in Cargill, I live somewhere else. Ha ha. The last drawing of the bouquet is just gorgeous! Janette, thanks for the “likes” and follow of my blog “Retired, Not Dead,” I really appreciated it. I was loved your new way of thinking of the word blog and very curious how such wonderful artwork is done on an iPad, so I’m looking forward to learning more from your blog. Thanks again!